And I never wished for that more than when I went in Budapest. Because no one ever mentioned the “ruin bars” to me. It wasn’t until my second visit that I got to know what these bars were. Now, I visit them whenever I visit the city. From outside, these bars look like normal homes. They don’t have large signs pointing the way, you don’t hear any loud noise, and there’s no line of people waiting to get in. 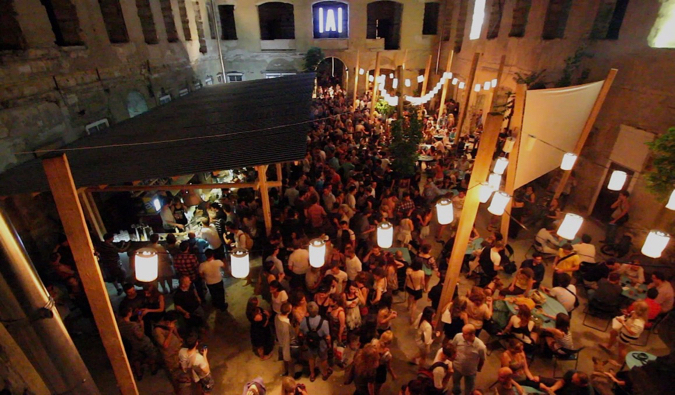 But once you walk in and enter the inner courtyard, you find yourself in the middle of a hip, artsy, and funky bar bustling with crowds talking, dancing, and enjoying the laid-back atmosphere. Large bouncers inside, along with posted signs, ensure that people are quiet on their way out, so as to not disturb the neighbors. Each of these ruin bars has its own personality, but they all follow a few basic principles: find an old abandoned place, rent it out (maybe? ), set up a bar, fill it with flea market furniture, have a few artists come in to leave their mark on the walls and ceiling, add in some weird antiques, serve alcohol, and watch people flock in. Since all these bars are in abandoned buildings, they open, close, and move frequently depending on whether the neighbors find out, the patrons get too loud, or an investor comes and buys the property to renovate it. When you’re in these bars, you feel like you’re drinking at your local thrift store. None of the furniture matches. It’s all old. It’s eclectic. It feels like they just ransacked your grandmother’s house. The ceilings are all designed differently. For example, Instant has a room where the furniture is on the ceiling, and Fogasház has bikes hanging from its ceiling. The places haven’t been repaired or fixed up, and there are still holes in the walls and visible pipes everywhere. But it all adds to the “underground” feeling each ruin bar has. If these places hadn’t been pointed out to me, I never would have found them. 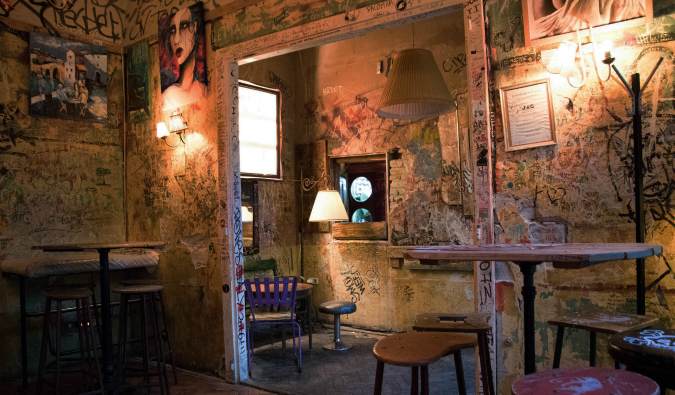 Though the ruin bar movement has become mainstream and less underground than it was when it started (or even a few years ago), many of the bars have done a good job of keeping their character and staying true to their roots – even as they fill up with more tourists. This was the original ruin bar. It opened in 2001 and starting this trend. It’s one of the biggest ruin bars and still one of the most popular. 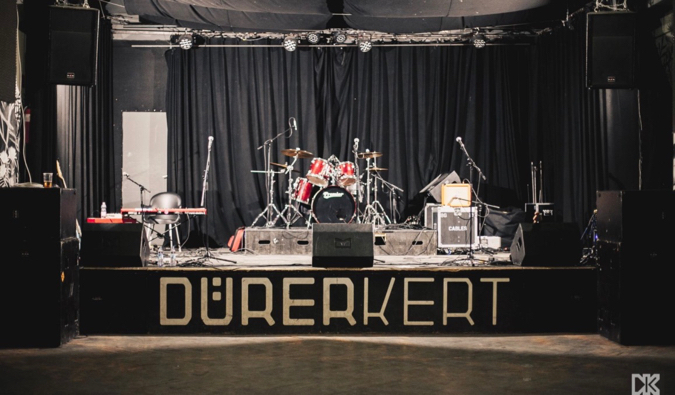 Once an abandoned factory, here you’ll find a large open courtyard, a top floor filled with eclectic furniture, cocktail bars, music, and even an old, stripped-down Trabant (a communist car) to have a drink in. All the rooms have a different theme. They also sell pizza, which, after a few drinks, makes for the perfect walking-home snack. Instant is located in an entire apartment building and the biggest ruin bar in the city. There are over twenty rooms here. It’s one of the more club-like ruin bars. In Instant, you can sit in what were once individual apartments and relax on furniture that looks like it was found on the street. They’ve knocked down many of the walls to connect the apartments and make space for the DJs and dancing. Given its popularity and the fact that it’s more “clubby,” drinks here are a little more expensive than in other ruin bars. But the vibe is still good. Akácfa u. 49-51, +36 70 638 5040, instant.co.hu/en. Open daily from 10pm-6am. 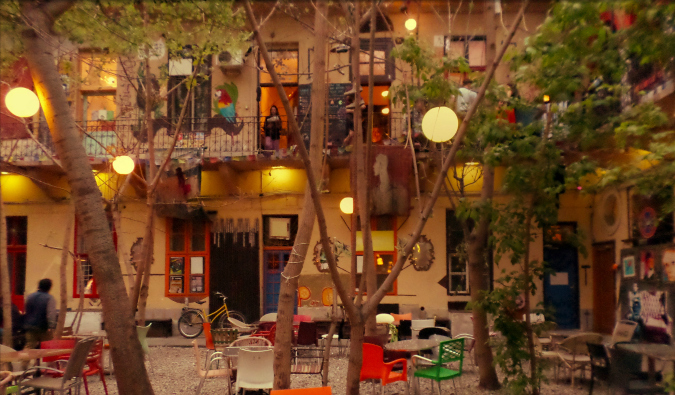 Fogasház is smaller, lower-key, and less touristy than popular Instant and Szimpla Kert. The “House of Teeth” got its name from an old dentist’s office sign they found when they were building the bar. This bar has bicycles and glasses hanging from the ceiling and is artsier than the other ruin bars. Small tables dot the inner courtyard, and you don’t have loud music drowning out the conversation. They often host art exhibits here. They also have a ping-pong table. It’s a hipster’s paradise here. Akácfa u. 49-51, +36 1 783 8820. Open daily from 4pm-6am. I’m not entirely sure if this place fits into the ruin bar culture. It was much fancier and trendier than the other bars I visited. It was like being in a “real” bar. However, I was taken there as part of a ruin bar tour, and, regardless, I love this place. You walk into the courtyard and are greeted by a tree with a red-eyed robot attached to it. It looks like a Transformer is about to attack you. There are two main rooms: one red, the other blue. They play a lot of dance music, and this place fills up toward the end of the night. 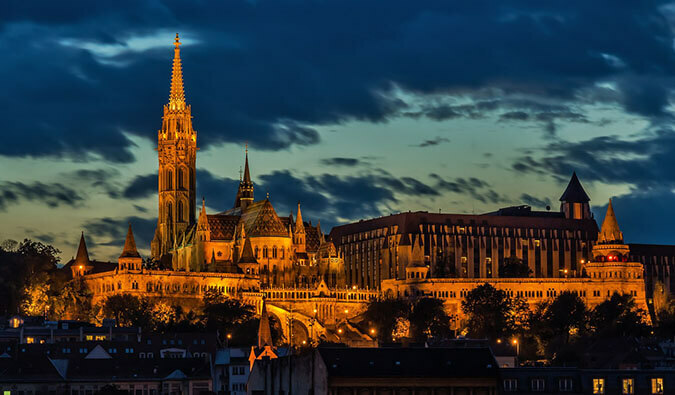 Located on top of a supermarket, Corvin Teto is popular due to its huge rooftop terrace, where you can get an expansive view of the hills of Buda and the buildings of Pest. This is another dance-heavy ruin bar, specializing in electronic music. I’d come up here for a drink during sunset and then move on elsewhere. Grandio is a ruin bar and hostel in one. 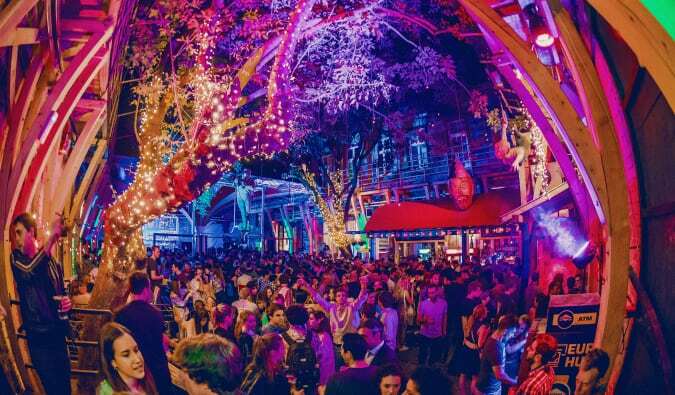 It’s famous for its outdoor, tree-filled courtyard but is mostly filled with travelers and people on bar crawls due to the fact that it’s also a hostel. 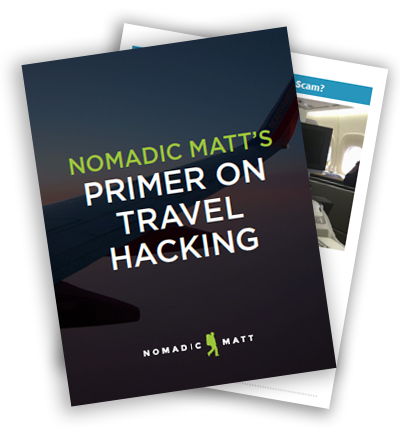 This is a good place to start your night and meet other travelers. However, during the day you can find locals relaxing here with a drink in the garden. A former university building, this ruin bar lets you tap into your inner college student as you drink few beers while playing foosball, Ping-Pong, darts, and a French game called pétanque (it’s fun). The courtyard garden is a good spot to enjoy all the live music that happens in this bar. 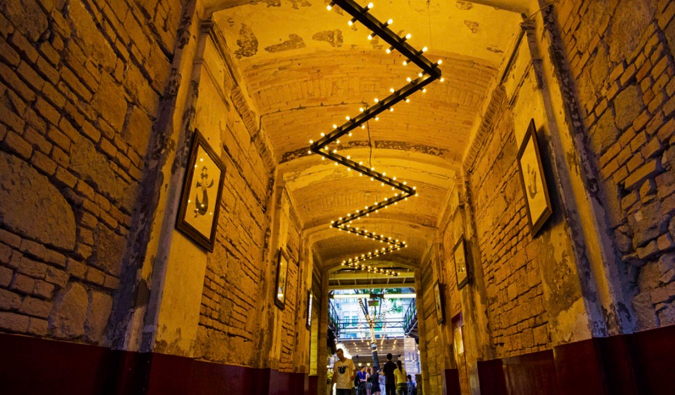 This is one of Budapest’s newest ruin bars. Mazel Tov (located in the old Jewish quarter) is a community center and restaurant serving traditional Jewish cuisine by day. At night, the courtyard is a party with DJs and live entertainment entertaining guests. 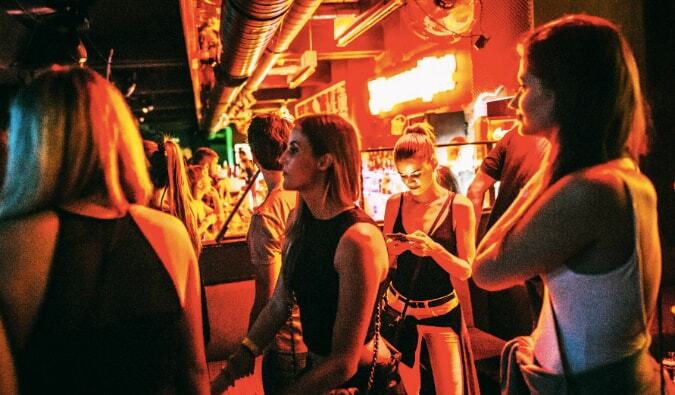 Located in a former factory in downtown Budapest, this minimalist space is made up of large, connecting courtyards, a gigantic dance floor to get your party on, and plenty of couches to lounge on if dancing isn’t your thing. There’s a lot of funky art hanging on the walls and the place is pretty big. The bar also serves some decent food too. ***Budapest may sell itself on history and thermal baths, but the ruin bars are by far the most unique thing about this city. 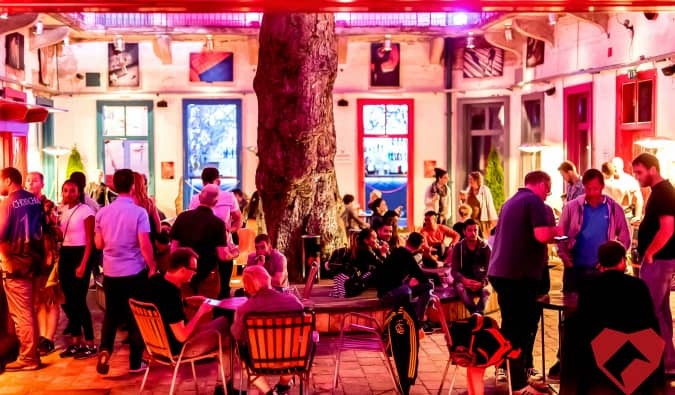 Even if you don’t drink, come spend time at these ruin bars because they are such a funky way to see a popular and totally unique aspect of life in Budapest. You’ll meet a lot of locals when you visit! Don’t miss them. 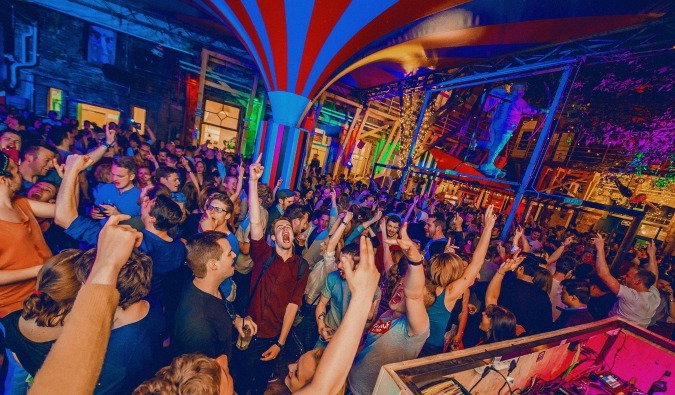 Retox – A big party hostel located next to Budapest’s biggest nightlife areas. This one is for serious partiers! Carpe Noctum – The staff here will end up feeling like family, and there are organized trips out on the town every night. Wombats – Another party spot, but Wombats is clean and comfortable, and one of my all-time favorites. Hostel One – Great rooms, great staff, and plenty of common space to socialize. The staff will even cook for you! Big Fish – New hostel located right on the main boulevard of Budapest. New beds, a huge kitchen, and a cozy common room! I am intrigued by these bars. I am going to re-read it at leisure and try to choose a favourite. 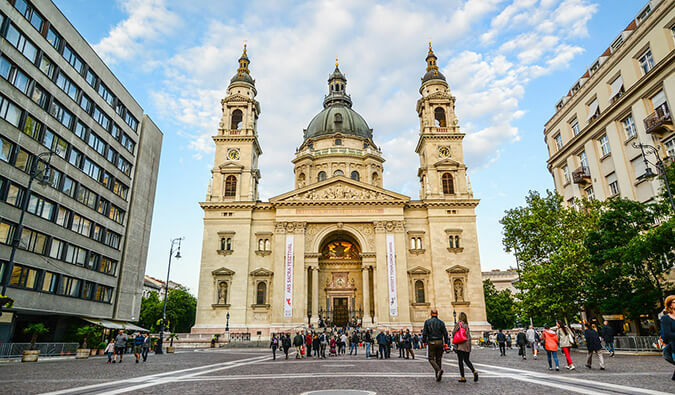 I am tempted to visit Budapest now! Jan.
Those places look awesome, especially the tree one. Bars in abandoned buildings? That sounds like a really great idea. Looks like a lot of fun! These look great! Have never heard of them before either, but they look like the kind of places I’d want to check out when I make it Budapest! Sometimes I feel travelers go more often to ruin bars than us, Hungarians. :) Nice to hear you had a great time here. Anyway I’m not surprised the tourism officials didn’t inform you about them. Somehow they try to make stronger the city of baths image which doesn’t attract that much young foreigners I think. Great post Matt. When abroad it is rare to see environments such as the examples above. I’m not a big drinker but I could definitely see myself spending a week or two exploring these unique bars. There’s something similar in San Francisco, except they’re mostly whisk(e)y bars. You have to cross through construction signs to get into this speak-easy-ish hole in the wall. That’s the cool thing about bars. The harder they are to find, the better. I completely missed these bars when I was there. They sound great. I’ll have to go back and check them out. I’m in Budapest right now and I’ve been to all these ruin bars. Hence I’m constantly hungover when I’m in this awesome city! It’s worth mentioning that Szimpla also hosts a bike kitchen (Top Floor) a few nights a week. After a nasty accident on the way in to town I was able to repair my wheel with the help of a few local cyclists. These bars sound really cool and the photos are awesome! I’ll have to put them on the list for my next visit to Budapest. 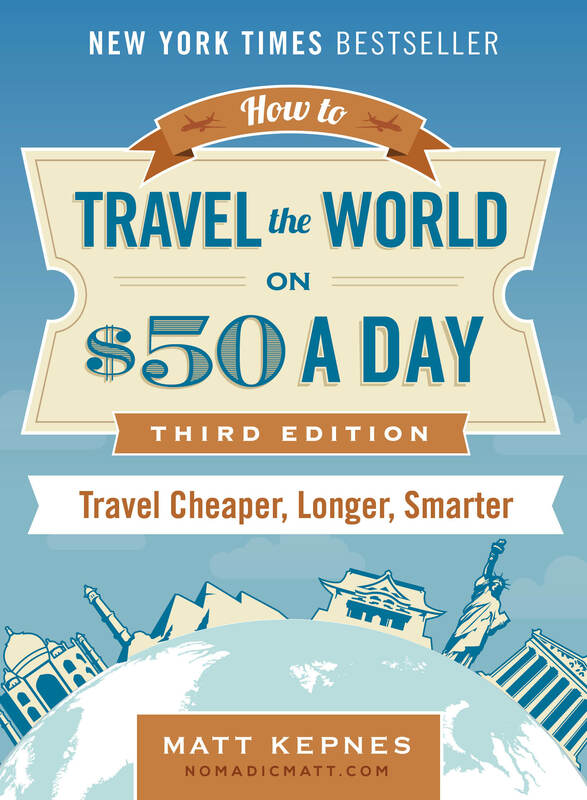 Although I’m curious about El Che’s comment that they’re quite touristy – any thoughts on that? Let’s don’t forget the Szimpla Kert was voted the world’s 3rd best bar by Lonely Planet in 2012 and A38 (also in Budapest) the No.1 pub in the world. No wonder you like it. Making it to Budapest next month. Heard about these, but didn’t know what was cool about them. Thanks for the details! Make sure you go. They are one of the most culturally unique things about the city. yeah i have been living in budapest for 2 years now… what attila writes is absolutely misleading for the average tourist. there is no evidence that mafia has nothing to do with these bars, or that these bars are dangerous, or that they are too touristy. 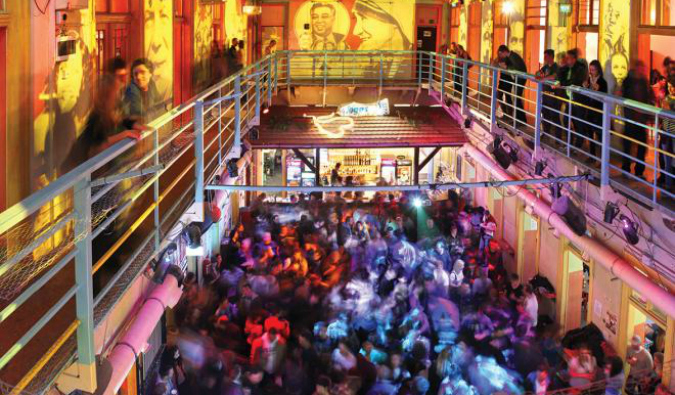 i am an american and i always take my guests to szimpla kert, you can hear lots of english in the evenings, and drinks are not as expensive as you will find on vaci street or andrassy street. obviously if you are going out on friday nights this bar gets totally packed, and in this case you should go to the bars that attila mentions, but overall szimpla is an awesome bar, especially in the summer. a must see. One of my Thai friends who is an artist and was a uni student at the time brought me to one of these in Bangkok in 1998. Completely off grid with power pilfered from the city lines. it was on the fifth or sixth floor of a building which was under construction then abandoned with the economic crisis so pretty much a concrete shell. I thought it was the coolest thing ever. Me and my boyfriend have been travelling around Europe, occasionally using your guides. (thanks by the way!) We’ve arrived in our Air bnb apartment which turns out to be in one of these ancient, large houses (over 100 years old to be exact) with is own courtyard and we wondered why the street was so alive and busy when we arrived on a Saturday night and it was a nightmare to find parking. …Only turns out we’ve booked our apartment is literally two doors down from Szimpla on the same street! Just to do some more additional research on Budapest i found they mentioned this bar on lonely planet and now on your blog as well! ha! i’m amazed we accidentally booked such a great location, what a treasure! The large sculpture honestly caught me off guard. Looks like a good place to party. There is a serious lack of good spots here in Winnipeg, I like 441main.ca but other than that man, it’s a variable nightlife void. I was in Budapest for a week. During that time I went to a Sparty, did a Booze Cruise, and went to numerous Ruin Pubs and still managed to spend less than $100 in that time. Budapest might be one of the best drinking cities ever. Thank you for this info, that is definitely an extra reason to prefer the smaller ones. I’m so happy I read this! 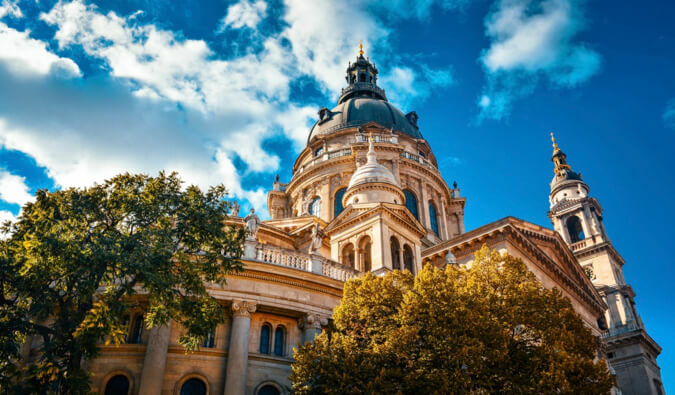 I’m coming to Budapest in a few months and I had never heard about these places. Now I have something else to visit. Also the concept is just genius. Abandoned buildings? Artsy relaxed old-furnitured ambiance? Definitely my kind of spots.